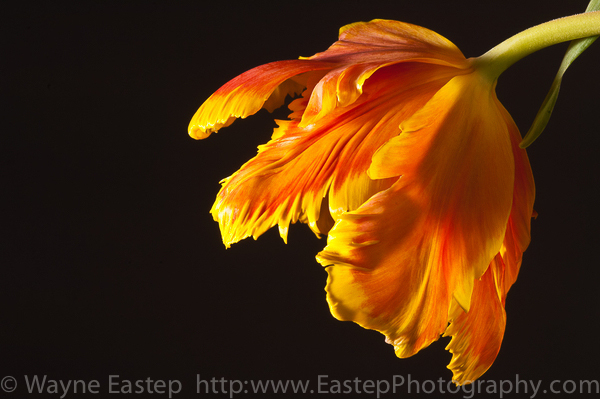 I’ve had a forty-year love affair with the parrot tulip. There are a few moments when I meet someone or discover something in nature when a connection is established that lasts a lifetime. I’ve been blessed with a few of these moments, the first time I saw Patti’s eyes, she’s been my wife for 45 years. The moment I looked into Layla’s face in the delivery room, 26 years later I am still in love with my daughter. Then there’s the parrot tulip. The first time I saw a parrot tulip was forty years ago while walking in the rain along Madison Avenue in New York City. A corner flower shop had a funnel-shaped galvanized bucket full of parrot tulips among the flowers on display. Even now I remember the response I had, it was mainly wonderment. Looking at the tulip was like looking at a flame painted into a flower. A few years ago I had a florist importer order direct from Holland two dozen parrot tulips. They were delivered every Monday during their blooming period. I would take them into my studio, study them and make new visual discoveries each week. The first image with the black background is an image from one of those sessions. Earlier this year while walking in the rain along 29th street near my apartment in New York City I came upon two parrot tulips. There were growing within a metal enclosure around a Ginko tree. 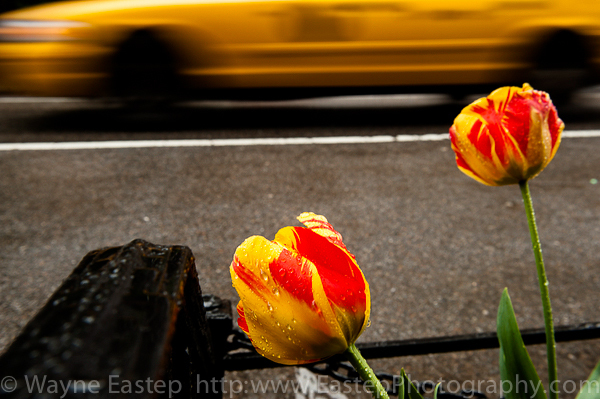 I got down low to take a closer look when I noticed the taxis heading westbound on 29th street. The image of that moment is the second one in this post. Bill Stettner and Wayne Eastep on location in Egypt. Perhaps the refusal to cut down a tree blocking an advertising shot for RJ Reynolds in Egypt, the dismissal of an over zealous dog handler in Central Park on a shoot for Polaroid, or not requiring a 6-year-old to eat spam on a photo shoot for Hormel show something about Bill Stettner’s humanity. Bill was a highly sensitive and complex person. I was fortunate to work with Bill at the peak of his commercial photography career. I assisted him on 250 jobs and saw the professional and the person behind the camera: a man with a terrific sense of humor, a remarkable awareness of the mechanics of image making, business acumen and ethics of the profession. He was human with the good and bad. He had a temper and could be impatient. He had the ability to be direct in a way that at times felt abrupt. He was funny very funny. Toward the end of my two years with Bill we had a conversation about what I might do with my career, as an “artist” I wanted to talk about the aesthetics of photography. Bill cut to the point and asked me, “What kind of lifestyle do you want?” I wondered out loud what that had to do with photography and he responded, “Everything. Look, if you create a photograph for an editorial story you’ll get paid $500. If you create the same image for corporate communications you’ll get paid $2,500, create the identical image for advertising and you’ll make between $5,000 and $10,0 00 dollars. If you want a family, to own your own home, go out to restaurants and have a nice car, you’ll need to shoot for advertising or corporate assignments. If you are ok with living a low profile life then you can do editorial or fine art work.” Thirty years later as a professional photographer I can affirm that Bill’s advice was sound. I wanted the “good life” and I wanted to do documentary projects, so I built a business that combined commercial and personal work, not an easy thing to do but worth the effort. Bill had a director’s ability and paid attention to everything on a shoot, both human behavior and physical details. I remember many times being sent to the print collection at the New York Public Library to research a specific time or place. Bill was intent on getting the hat, car, soda can, the hairstyle and every other detail as authentic as possible. One assignment comes to mind that will illustrate this attentiveness. Bill Stettner shooting in Louisville, KY.
We were creating an album cover for Columbia records. The layout indicated a Victorian house with picket fence, mailbox and sidewalk. Bill commissioned a model maker in New York to build the Victorian house to scale. The model stood about thirty inches tall, included interior lights that worked, a one inch tall tricycle with pedals that turned and a mailbox with an envelope inside addressed to the artist c/o Columbia Records 1221 Avenue of the Americas, New York, NY 10020. I asked Bill why make the doors and windows open, the lights turn on, the tricycle work and place an envelope inside a closed mailbox with a handwritten address. Bill answered, “The purpose of the image is to tell a story. As photographers we must go inside the story and illustrate it with authenticity. The intention of our effort and the energy we put into the picture will inform the final photograph in a way that the viewer will believe .” I was at an impressionable phase in my career and took that advice to heart. The advice has caused me a lot of extra work, but I believe my images are more authentic as a result. Bill Stettner was a storyteller. He told stories, often very funny stories, better than anyone I’ve ever heard. That’s saying a lot because I grew up in the South where storytelling is a way of life. Time and again he helped a person who was self conscious in front of the camera relax and open up as a result of a story he told. He had a love of the story and great sense of humor. effective in strengthening the profession of photography. He made my career possible because he gave me my first chance to work as a photographer. His plain talk and straightforward advice that I actually took to heart has helped me have a career that provided a good living for my family and a fulfilling life as an artist. Not only does Bill’s memory live on in my heart it is manifest in my creative and professional life. With gratitude I honor Bill Stettner.